Welcome to our 34th episode in our relatively new podcast series where we cover everything related to investing in tax-delinquent real estate. In other words, we focus on properties where the owners have not paid the property taxes. As a husband and wife investing team, we’ve done nearly 3,500 deals – in land and houses – with little competition and big profits. And we want to share what we know with you. In today’s episode we’re going to shift gears a bit and focus on business building. We’re going to go over our very clear-cut process to show you how to grow your business. 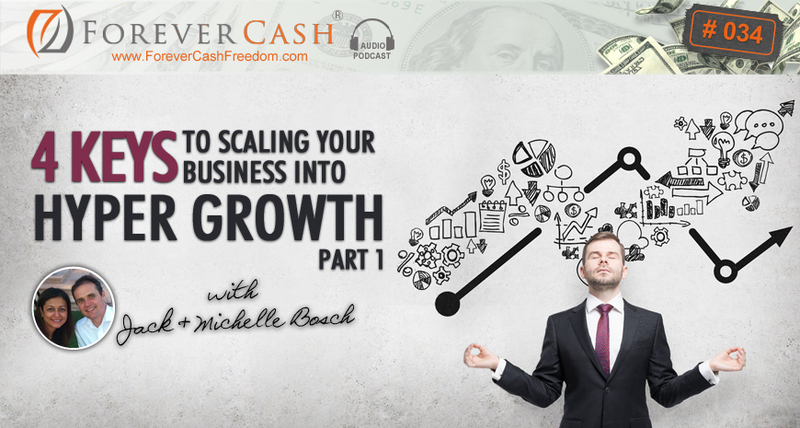 This is actually Part 1 of a great 2-part series that’s all about the right steps to take to scale your business. Intro: Are you ready to transform your financial future? Here’s your chance to see inside the mindset of self-made millionaires, Jack and Michelle Bosch as they pull back the curtain on secrets that can make you rich. Discover how everyday people are breaking the norms and building empires from the ground up, using a little known yet proven and time-tested wealth building real estate strategies. It’s my pleasure to welcome you to the ForeverCash.com podcast, and introduce you to our hosts, serial entrepreneurs, investors, educators, and best-selling authors, Jack and Michelle Bosch. Strap yourself in for the ride of your life. Jack: Hello everyone, this is Jack Bosch. Jack: And welcome to this week’s podcast. We are very excited to share with you something really-really cool today, as a matter of fact shift gears from our usual real estate focus, into a plain business building focus today, right? Michelle: Absolutely, I will love talk about business growth. Jack: Right, business growth, that’s very cool because whatever you do, whether you do real estate flips, whether you do internet marketing, whether you have a plumbing company, whether you are in charge of marketing for… as an employee for a bigger company, you are in charge of business growth. You are operating in a business environment, and growing a business is actually not something that’s in a black box that you will never figure out, it’s actually a very clear cut process that we can talk about. Michelle: Yeah, absolutely and I wanted to basically go through a few concepts during the course of this podcast. And that is number one, the ceiling of complexity, number two I would like to talk about freedom along with business growth. Number three is the zone of genius, and basically how having a little bit more understanding on those three things. You can really use your business and grow your business such that you can enjoy the freedoms that you are starting the business for to begin with. Jack: Awesome, very good, and before we get started with that let me just do my quick usual spill that I want to remind you that you are listening to the Jack Bosch and Michelle Bosch, husband and wife team. The Forever Cash Real Estate podcast, but today we are not talking about real estate, but usually we talk about real estate, we are talking about actually tax delinquent real estate, and how you buy properties for literally five to 25 cents on the dollar. So you can go back, listen to the other podcast episodes, many of them are about real estate. But really kind of like from now on we are going to sprinkle more of these business building ones in, because really at the end of the day as I said at the beginning, it’s all about approaching whatever you do to make money in a business mindset, and a business like way. And the more you approach it with the proper tools in your hand, with proper vision, with the proper execution plan, with the proper strategies, and what we call the four pillars of basically of the why, the who, the what and the how? The more you do that the more successful any business you are actually going to start will be. So having said that if you are interested in learning about our number one method to implement that so far, which has been our tax delinquent real estate you can go to ForeverCash.com/Freedom, and download a free course that shows you basically how we… that gives you an introduction into the five different real estate techniques that we use. So having said that though let’s shift gears, and let’s talk about the basis that is the foundation under our any kind of investment that we do, under our educational business, under our real estate business, under our rental portfolio for that matter. And that’s how to actually build a business that’s growing, and one where you have a blast, and where you have freedom while you are growing. Michelle: Yeah, so if you are listening to this podcast you are either an entrepreneur that is already in business, or you are looking to start your own business whether it be in real estate investing, or whatever it is that you decide the vehicle to be. But basically you are looking and you’re listening to us because you are looking for a change. You are looking for some kind of a transformation; you are looking for some kind of a growth. I usually use those words interchangeably when you want change, when you want transformation; you are looking really for growth in some way shape or form. And growth requires courage, but it also requires strategy. So today I want to talk about a little bit more the strategy on how you should be thinking basically when you want to go and go through this process of growth. So the first thing that I would like to talk about is called the ceiling of complexity. This is actually a term I did not make up, it’s a gentleman by the name of Dan Silverman actually came up with this terminology to describe very accurately, I think what a lot of entrepreneurs go through when they are maxed out, and they want growth, but they don’t know how. So perhaps Jack you want to explain a little bit about the ceiling of complexity. Jack: I would love to yes, so the ceiling of complexity is really something that every business owner, or even as an employee if you have given a new position or a new job has faced. And very simply means is when you are… let’s talk about it from business owner point of view. Let’s say you started your business, and you jumped in, you had this great idea and you say like, this is it, there’s a market gap, I need to jump into that, I need to do this. And you love it and you do it, and you get your first customers, and you start building a couple of processes for how this works. You deliver great work, let’s say you are… really it doesn’t matter what business it is for example you build furniture. So you build the best furniture in the world, you deliver your furniture, your customer are raving, and all of a sudden you get more orders than you can handle. So when you get more orders than you can handle you start hiring a few people, and now… but in your life you have never managed people around you. So now when you have amount of people around you, you need to shift from being the employee, but basically being the technician in this case as the E-myth says to becoming the manager. And all over sudden you need to tell other people how to do it, so instead of you doing all the work, you are giving some of the work to other people, but you have… you don’t know how to do this, and soon enough all of a sudden you just… well, basically say like, well, just go over guys, take care of it. They start taking caring of it, but they don’t take care of it the way you wanted it to be taken care of. And soon enough orders fall through the cracks, soon enough the furniture is not made as prettiest as you want to, or it’s delayed, because you are busy with all these other things. And now you don’t get to do this anymore, or you work until late nights, and you get frustrated, and you get worn out, and you get burned out. And you are basically at that point where you basically say you know what, this is so frustrating, my staff is not doing what I wanted to do, it doesn’t work. I should just shrink back. When that thought comes up the very first time, you know you hit your ceiling of complexity, because your current ability as a manger, your current ability as a business owner has hit a ceiling, it’s like it has hit a plateau, has hit a level that basically you currently can’t break through without changing something about the way you do it. Jack: Even though you might have a couple of staff members, you end up… you have fires going on all the time that you need to… not real fires in houses, I mean like operational fires. Michelle: Follow ups with leads are not happening timely, and as a result your competitor just swept that property from under you. This is kind of like how it would feel and look in a real estate investment world. Jack: Basically in other words stuff is falling apart. So all of a sudden stuff is falling apart, your business seems like it’s falling apart, and you are more stressed out than you’ve ever been. And it really feels like the business is controlling you instead of you controlling the business. Michelle: Yeah, because what happens is when you are at the ceiling of complexity, you are basically working 12 hour days, or 15 hour days. And really working longer hours is not helping you, it’s not helping your cost, you are still going from crisis to crisis. So you started the business, or you started in real estate investing because you wanted some freedom. But what you find when you’ve hit a ceiling of complexity is that you have no freedom, and that is causing strain in your family, that’s causing strain in your relationships, in your health, and just your outlook on life. You are not having the freedom that you started this business for to begin with. Jack: Yeah, you are not… you are probably not fun to be around, you have… you probably I don’t know, you drink more, you smoke more if you are a smoker, hopefully not, like it affects every part of your life. And so if that sounds in any shape or form remotely familiar, then be aware that all it means is that you hit your ceiling of complexity. So now how do we get through the ceiling of complexity? Well, by gaining more capabilities, right? By actually, by figuring out how, by putting in systems and by becoming a better manager, by learning some tools and… It doesn’t mean that you have to become a different person, but you’re the same man, as a result you will. But you have to learn some simple tools that will allow you to manage more with actually less time and less time, and therefore have more freedom. Michelle: Yeah, absolutely, and so here I would like to talk about then so how do you get over this ceiling of complexity. And Jack just alluded to it, you need some systems, you need some processes, you need some procedures in place. You want to basically start thinking about your business, and the things that you currently do as you not continuing to do them for very long. Think about it as if you are doing a marketing piece, if you are preparing direct marketing campaign, sending out letters to try to get more sellers to sell their properties to you. You want to think about all those actions and all those initiatives basically, that are all part of your process in a way such that you may not be doing that six months from now. And whoever is going to be doing that is going to need some guidance and direction. So you want to set the foundation, you want to lay the foundation, the structure in paper. Actually out of your head and into a process that then you know you can go ahead and use technology to expedite that process, to make sure that certain things happen. But basically you want to start thinking about things not as you doing them constantly, but as how can I basically go about this task and what process can I lay out, so that in six months’ time somebody else will come. Jack: Automate it or delegate it. Michelle: Automating it and putting it in or delegating it. Jack: So going back to the example of you having now a few team members, the way this looks is that you basically want to have two actionable steps. You want to have everyone in your company, and we like doing it this way, we like… if you already have a process in your mind, then you can start it by writing down that process, how you think the work should be done. So if you however are one of those people like I for example that, I just basically want stuff to be done, and I’m not very good I’m not very good at coming up with brand new processes from scratch. So what I do, but I’m very good… and without bragging here, so I think I’m pretty good at improving processes, and making them really good once there’s some bare- bone process to start with. So what you can do is you can… if you already have staff that are doing things a certain way, have them write down the way they are doing it. Michelle: Yeah, it can be as a simple, basically a simple checklist. When you want to put a property on a website, what are the steps that you take? And it’s basically it could be as simple as a checklist, yeah, and that’s basically the first iteration of the process of putting a website in market… I’m sorry of marketing a property and putting it on a website. Jack: So you start with whichever business, brick and motor, real estate business, have somebody put down the process or as I said, if you are already… if you are process oriented person, then you write down the process and we’ve done it both ways. So at the beginning we had to come up with the processes before we hired somebody. So we wrote down the process, and then we had that person execute that process and that person then came back to us and says like, you know what, we might want to… I think if we do this process in X, Y, Z a little bit different, it would be more effective. So we basically move the process back and forth, changed it around to make it better and better. But if you are not a process oriented person, you ask the other person to start up with it; your employee says like how would you do this? And then they come up with something and then you identify the holes in it, you say like no-no-no, at this point there’s something missing, we need to really add this, subtract this, this is a duplicate process, we can automate this, and so on and so forth. But what I’m saying is over a little bit time, over just a couple of weeks; really it only takes a few days for that matter. Jack: Is predictable and reliable, because nothing is worse than you going somewhere, getting a great experience one time, and then all of a sudden the experience is different. Even if all experiences are good, the fact that they are different just means that there’s no reliability, and people want to know… why do they go to McDonald’s? Not because the food is great, but because they know it’s a reliable service. Why do they go to Subway, because they know exactly what they are getting once they go through the line? So predictability is even more important actually than quality, now quality is obviously very-very important, but predictability is really important. Michelle: Predictability over quality yeah, and so for example in your real estate investing business, let’s talk about mailings and the direct mail that goes into it. If you want to have predictable drip of properties of sellers basically calling you, and wanting to sell their properties to you, you need to basically put a process so that that direct marketing piece is happening predictably on a specific day of every month, or of every week. And with that will come not just the predictability in terms of that particular process, but there will also be predictability in your cash flow. Because that means that if you have so many pieces of direct marketing going out every month at a specific date, you can expect every week to be closing on X amount of deals. And that really transfers in predictability of cash, and cash flow. It’s a beautiful thing, this whole laying out a process for what it brings at the back end. In the beginning you may feel that it’s taking a lot of time, that you are not hustling out there and talking to sellers, but if you just take it… You know, if you just take a few hours every day I guarantee you that most of the things that you are currently doing in the course of a week, you will have processes, you will have checklists, you will have set a structures and a foundation for when you are ready to hire a VA, or you are ready to bring in a full time employee, they can execute and be predictable basically. Jack: Right. So I wanted to jump in while you were talking. I waited until you finished, I didn’t want to interrupt you, but I wanted to jump in exactly and basically say… but Michelle I just want to do deals. I want to be out there hustling and so on. And you know and that’s exactly the point when you hit that ceiling of complexity, it’s the point when you realize that you have to go from just ego, from just hustle, from just making things happen, to a manager, to a CEO who now manages the systems and manages the people and the systems, so that they can do better work than you yourself could ever done in the first place, and you do that with what Michelle just described. So the bottom line is once you do that, once you understand it, once you internalize that, now you have broken through that ceiling complexity and you can continue growing, because now you have a cool system in place, you have people in place, they know what they need to do, there’s rhythm structure, rhythm of success as we just talked about, and they lead you to the next ceiling because guess what, this is not going to end, this is not going to be the end of all from there. You can’t just grow until a billion dollars; you’ve got to hit another ceiling of complexity and another, and another and another. And every time there’s another tweak to be done to the system that allows you to the way you approach it, that you address it. Now with all the systems in the world, you still want to make sure you work on what’s really important for yourself. And you work on what we call your genius zone. So Michelle can you describe your genius zone just a little bit more. Michelle: Okay, so the genius zone requires that you do a little bit of self-study and a little bit of… and be self-aware. So there are certain things that you definitely do not want to delegate out, and those are the things that absolutely energize you. They are your contribution to either the team or to the world that make a real big impact, and that in the process bring you meaning and that you love doing. So this is… when you are operating in that zone, and people usually think it’s a skill, but it’s really a way of being. It’s a quality, it’s part of purpose. There’re so many intangible elements to it, but what is concrete is that it is so natural to you. It comes… it is so second nature to you that others are in awe when they are witnessing you operating and working in the zone of the genius. So those things are those activities that are within the zone of genius, these you don’t want to delegate. These you want to keep. So there’s a process of finding, it’s not easy. You can’t just wake up one morning and ponder and ask the question. It’s usually… it’s a process of finding that thing that others can see, that is so second nature to you. You yourself don’t even know it is. Then the next thing that comes is having the discipline to stay within, to stay within that zone and not want to get out of it, and go and figure out is it direct marketing piece getting done. If you don’t have a process down and if you don’t have the structure down, you will want to get out of the zone of genius and start putting out fires. But if you are taking care of the foundation, you will probably be operating exclusively in the zone. Jack: And that’s so wonderful exactly right now to actually something. I want to reiterate something you just said and that is, or just summarize it if I may, and that’s just the piece that when you get into that genius zone where you do what you love doing, what you were born to do, something that you have been doing since you were a little child and that you love-love-love doing, when you get to work in that area, your business is no longer stressful, it’s no longer a hustle, it’s no longer anything. So if you use the real estate example, if you love doing deals and negotiating deals and that’s just, you could do that all day long, and as you do that you love life, but as you get sucked into the operational part of the business, you hate life. You don’t like doing that part. Well the way to stay in what you love, is to actually… first of all identify it, and secondly put in the pieces and the structures to actually make that happen. Now how do you do that? Well, we have actually, we believe we’ve actually figured out how to do this, and there’s a clear process for that. For the clear process we actually put together something that we just… that I want to quickly talk about, which is what we call The Ultimate Boardroom. And The Ultimate Boardroom is… we really looked at that and it’s like, we belong to business associations and we know a lot of entrepreneurs. And what was really shocking when I joined one a couple of business organizations is that how little free time the average business owner has. Now, I know business owners that run 10, 20, 30 million dollar companies and they are owned by their companies. So they have not yet figured out what their genius zone is. They have not yet figured out what their system is. They constantly are forced to jump into the operations of the business. Michelle: They don’t have any clue about what the zone of genius for the company, for the team is, their strengths and their modus operandi. Jack: They don’t have a corporate culture in place, and as a result keeping that business running is a constant struggle. They look good on paper, they look good outside, they drive the Ferrari, they drive the BMW, the Porsche and they live in a nice house but man, they are working 80 hours a week. They are strained their relationships, they might be multiple times divorced, they don’t know their kids, and they are not… they don’t have that figured out. Now we looked at each other when we realized that. It was like hey Michelle we are doing something right there. Again I’m not… it’s not designed to brag. But I just want to express that we are taking the summers off for example. We take two months in summer off. We go travel around the world, and while we are gone, our business barely misses us. Actually our team tells us it’s better if we are not in the office. Michelle: Because they get more done. Jack: They get more done that way. Decisions are being made, we give them the instructions that if it’s something urgent, text us, wherever we are in the world, if it’s a text, we have our phones with us, we take pictures and things like that. Michelle: Urgent means somebody has to be dying. Michelle: Corporate identity so that whoever you bring in to the team fits that corporate identity. Jack: Exactly so we got people attracted by it. So we basically build something that we believe is duplicable also, because as we started looking around the business literature, basically what we have kind of subconsciously to a degree done a lot of the things that the business literature talks about that you should do. So we are very excited about that. Of course we are not perfect, but at the same time, we’re constantly… it’s an evolving process. So we put something together for business owners that want to grow yet when they want to grow, they want to also have free time. They want to be in control, be in control of their life, and they want to build something that actually has a meaning to them and their family. Not just designed to make a book, but something designed that they actually gives them a blast where they wake up in the morning juiced up and excited about going there. And that’s what we call The Ultimate Boardroom. And The Ultimate Boardroom is really a hybrid… it’s not a hybrid. It’s a combination of the best of two worlds. It’s a combination of the best of a mastermind, and of a business coaching program. Because the business coaching program, like in the mastermind, and we join… we’re members of multiple masterminds, masterminds are absolutely awesome. It’s like having a board of directors around you that you get 20, 30 minutes to come up front and throw up what’s your major challenge in your business right now, and then you have everyone in the room help you fix that challenge in the moment. So you have a fire burning. Michelle: Yeah within minutes. A monumental problem, it’s fixed. You have the answer. Jack: You have the answer. You see the light, and often it’s a very simple fix. So you get those fires that are burning in your business, you get them fixed in an instant by your board of advisors, by your board of directors in the mastermind. Michelle: Or if they cannot fix it, all of a sudden you have access to an extended network, to their network of who can help you basically fix whatever issue is happening in your business. Jack: I’ve literally never seen a scenario where somebody who did not raise their hands they are like, “It hasn’t happen to me, but I know a friend that went through that. I can put you together with that person and they can tell you exactly what it takes to fix it.” Or they say, “Yup, it happened to me, and here is how you fix it.” And boom when you walk out there with your biggest hot button issue fixed. The problem with masterminds though is… the downside of it is that there’s… of being… of the mastermind concept is that there’s usually no guided structure to it, no guided process that helps you fix the underlying or build the underlying pillars that your business stands on. Best practices. There’s no guided program that tells you, “You know what, for you to really have the foundation to allow your business go into hyper growth, and allow your business to grow into a multi, like to double in a year, triple in a year or something like that, without you going crazy,” that part is not in the mastermind. But that part is usually taken care of by business coaching. So if you go with a really good business coach, they are going to walk you through a process that allows you to put those pillars in place, so that you have the foundation and you have the structure, you have your genius zone figured out, you have your systems figured out, you have your reporting structures figured out, you have your purpose figured out, you have your on boarding passes for the people figured out. You know how to hire, who to hire, how to train, what systems you need to do. What marketing systems and the full package. Now what we have done is we basically married the two concepts. So into what we call The Ultimate Boardroom, and you can find out more of it very simply at www.UltimateBoardRoom.com. And what we are basically… it’s a mastermind with a coaching aspect. Michelle: Yeah and there’s basically six pillars to the ultimate board experience. And the first one is of course the why, is basically amplifying you the business owner, the leader, to find your zone of genius, your purpose, your vision, your ultimate growth goal, your modus operandi, your strengths, and then we move on to the who which is your team. And basically how do you maximize a team and how you horn in on your team’s genius zone, on their strengths. What are your values? What is your corporate identity so that you can attract the right people in to your business? What is your on boarding blue print to bringing that person on board, your training rhythms, your delegation formula, your reporting method and your communication rhythms? I mean, we really go into the nitty-gritty of how to maximize the who, the team because most business owners think that the client is the most important part. But once you are in a business and you are a business owner, really it’s your employees, it’s your team the most important part, because these people are the ones that take care of your clients, and these people are the who that also put the processes in place and put the systems in place. Jack: And what are the actual tactics that you use? And the funny thing is as we put this together, based on our own businesses, based on having taken business from zero to eight figures in a matter of a year, from zero to multiple six figures in a matter of six months, we realized that most business owners start with the tactics. Michelle: Hustle because cash is your biggest qualification. Jack: Right, but then if you don’t stop at some point of time when you reach that first level, the ceiling of complexity. When you don’t stop and turn around and put in the other pillars, you will end up actually either burning yourself out, and end up crushing and burning or working continuous for decades to work 60 hours, 70 hours a week, and be completely burned out. It doesn’t have to be like that. It doesn’t have to be like that. There’s actually a way to run a business that you can work 30, 40 hours a week and literally grow your business compounded, grow your business 20, 30, 50, 100% a year depending on what niche you are, and what your goals are. And as a matter of fact, double or triple, quadruple your profits and going forward, and at the same time doing this all while being at home for dinner at 5:00 pm with your family, picking up your daughter from… your kid from school. Michelle: And most importantly you are having fun. Jack: And in the process having fun and being literally in all of how the beautiful enterprise can actually work. Michelle: Yeah absolutely. At the end of the day, you know, when you are looking to grow a business, you are really looking to grow people, to scout people. If you can use your business, your particular enterprise to sculpt yourself, your team, your clients, everyone that comes in contact with you, at least for me, that’s a happy day. It brings me meaning. I’m excited to jump out of bed to go ahead and do exactly that. So like Jack was saying, it’s having clarity on what your vision for that business is, focusing on your highest and best talents, getting quality productivity from your team, having perfected systems to scale without any frustrations, more freedom of time so that you can spend it on the things that matter most. For most of us if we are in the season of small children, that’s where the bulk our time, that’s where we want to spend most of time with, confidence in your cash flow, strong business growth and strong personal and professional relationships. Then I think The Ultimate Boardroom is something that you definitely need to check out. It’s not for everyone. You have to be at a certain point in your business, in your life where you want change, when you want transformation, where you want growth, and not just growth of revenue, of cash, but it’s a more holistic type of growth. Jack: Yes, holistic type of growth. You want to have a blast while you are building a business that means something. And for that though, you have to have a business already, you have to have a business already, and if you already have a business, and you are already doing something, it doesn’t have to be a real estate business. This is not real estate program, it’s really a business growth program and any kind of business is welcome. So as long as you fulfill the criteria that you can read on www.UltimateBoardRoom.com. So with that I think we’ve got to do a part two about business growth. We actually talked probably too long on a couple of things, sorry not too long. It’s just the time that it needed, but too long to fit it into the actual podcast right now. So we are making a second part of that, where we’ll talk about some additional pieces, and looking forward to presenting that to you. So with that, I say, again the podcast notes the transcription, the audio, a bunch of these things are in the ForeverCash.com/Podcast. Again, our free course is under ForeverCash.com/Freedom. And the link that I mentioned again over time is www.UltimateBoardRoom.com. Michelle: And with that, thank you very much. Jack: All right thanks, bye, bye. Outro: Thanks for listening to the Forever Cash Freedom podcast. Subscribe now for future content packed episodes on how to push the ejector seat on your financial hamster wheel. And discover our radical way to freedom and wealth through cutting edge real estate investing strategies. To learn more about living the forever cash lifestyle, investing smartly, and becoming financially free, visit www.ForeverCashFreedom.com to claim your free forever cash starter kit today.